There are a number of ways to complete the journey of this stage. For this reason the scallop shells on the milestones points downwards with the intention of not indicating any specific direction. By doing so pilgrims are reassured that they are travelling in the correct direction. 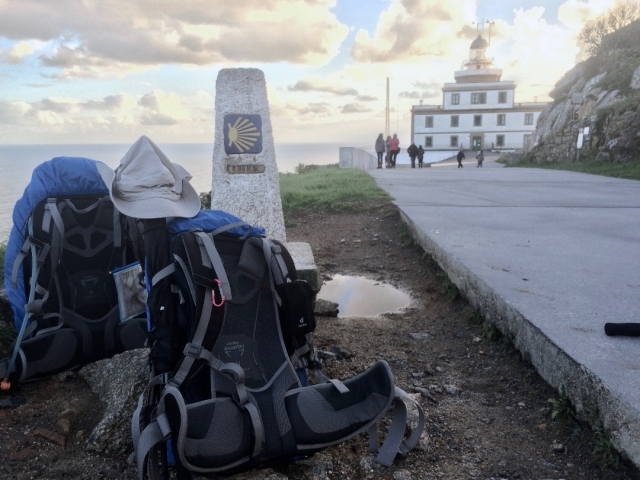 The chosen option for this journey is Finisterre-Muxía. To begin the itinerary pilgrims have to return to the beach of Langosteira and continue along the main road. Passing through San Martiño de Duio, Escaselas, Hermedesuxo de Baixo, San Salvador (with the hotel Dugium), Rial, Buxán, Cástrese (with the bar Casa Costureiro) and Padris, where the itinerary connects with the variant from Rostro. From Canosa hikers descent to Lires, passing from 70 meters in altitude to almost sea level. The descent begins on cement although a little later, after passing a water fountain, without health guarantees, the route takes an earthy path, on occasions stony and with the added possibility of becoming muddy after periods of heavy rain. Walkers will need to pay extra attention at the junctions to avoid taking the wrong turning. After leaving, on the right hand side, the river Lires hikers border around a beautiful cornfield and embark on a grassy, carpeted path, later on asphalt, that will lead them into Lires, the main place with services of the day, here walkers can recuperate strength. The entry is on asphalt, leaving on the left hand side a square with outdoor tables and a fountain, near to the church of San Estevo de Lires. The estuary of Lires is one of the smallest in Galicia. It is important for pilgrims to have the credential stamped in one of the hotel establishments if they want to sleep in Muxía. The river Castro is crossed. Climbing to reach Baosilveiro, Frixe, Guisamonde and, Morquintián, where there is a place to rest with a fountain and a washing area. Confusing signposts After Morquintián, at a junction, an official milestone invites walkers to continue the journey to the left-; however, a cross on the ground discourages hikers from continuing in this direction-, on a variant route, which, further ahead, has no signposts. For this reason, walkers are recommended to follow the itinerary to the right (there are yellow arrows painted on the asphalt), to an alternative route, which, in addition, shortens the days’ walk by two kilometres. If the route to the left is chosen, the following journey will have to be taken; first walkers will turn right onto an earthy path to continue, with out signs posts, until reaching asphalt. Later walkers should continue to the right in the direction of Martineto. On asphalt and, now in descent, Figueroa is reached, a location without directions. Hikers must continue ahead until arriving at two adjoining houses (the one on the right is number 3) to follow the path that separates the two. On a stone there is a red arrow. This narrow path leads to an earthy track where there are new signs of the same colour. On continuing pilgrims will face two junctions. The first should be taken to the left. If the second is taken in the same direction it will lead them to the beach of Muxía, on a descent with beautiful views. However, if taken to the right, the path connects to another itinerary and heads towards the right to continue via Facho de Lourido. If walkers do not lose sight of the red arrows the route merges at a milestone, just before the last descent to Xurarantes. From here they continue together until reaching Muxía. From the posterior crossroads to Morquintián the route continues to the right, at first on asphalt, however, just over 300 meters later walkers turn left onto a wide path and, difficult to walk on, which, ascends until reaching the surrounding area of Facho de Lourido, the highest point of the stage, at 269 meters in altitude. Its name makes reference to the ancient fires and torches that were lit along the peaks of the coast to enable the ships to navigate. From this point there are stunning views over the stretch of coast that extends from Cape Vilán, to the north, and Cape Touriñan, to the west. It is also possible to see Camariñas and even Muxía, the end goal of the pilgrims. The descent towards Muxía Xurarantes is passed through, descending to Fonte do Bico, the beach of Lourido, the DP-5201 road, and after another two kilometres the centre of Muxía. Leaving the football pitch on the left and entering the town via avenida Doctor Toba. 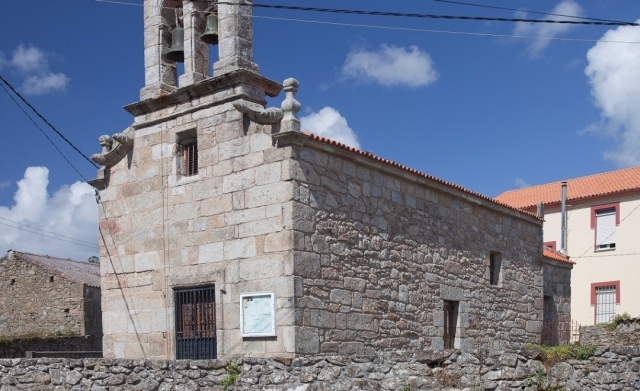 To locate the albergue pilgrims will have to pay attention to the signs situated on the houses, which direct the itinerary to the right via the streets of Campo das Pinas, Os Malatos and Enfesto. Towards the sanctuary of Barca To end this stage there still remains one last task. Pilgrims have to walk along the coast until reaching the port. A sign leads walkers to the left, in the direction of the tourist office and the pilgrim information point; here travellers can collect the Muxiana, the document accredited to those who have completed the journey from Santiago to this location. The itinerary continues to the left and enters a pedestrian area towards the church of Santa Maria, a beautiful and small temple situated on the sheltered rocks of Monte Corpiño. On the same path, pilgrims will reach the sanctuary of Barca, an authentic stone monument on the sea front, which, together with Finisterre, has been converted into the goal of the Camino. This temple was badly damaged during the Christmas of 2013 due to a fire caused be lightening. There exists a belief that the Virgin Mary came to this place in a stone boat in order to encourage the Apostle Santiago on his preaching mission through the northeast of the peninsular, a fact that links the sanctuary to the Virgin of Pilar from Zaragoza. In September this place hosts the religious festival of A Barca, one of the most famous and popular in Galicia. Close by A Vela is situated, also known as Pedra dos Cadrís, also believed to be the petrified sail of the divine boat. The faithful are supposed to pass beneath it nine times in order to cure back pain. Close by there is O Timón (the helm), the third piece conserved in stone of the of the Virgins vessel. Alleged to guaranty fertility to women. This stage does not pose much difficulty with the exception of the nine-kilometre climb to Facho de Lourido; a stretch may cause some cyclists to dismount. 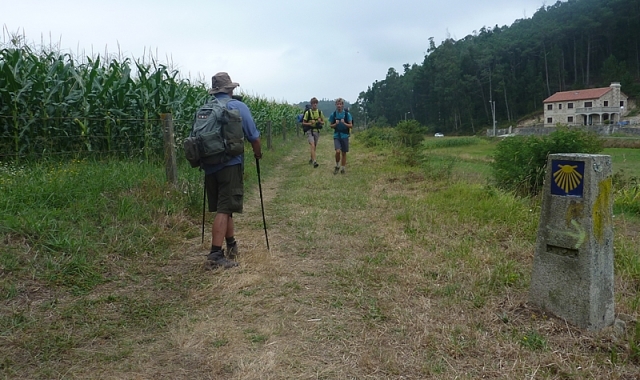 1 reviews Distance to Santiago: 75 km.